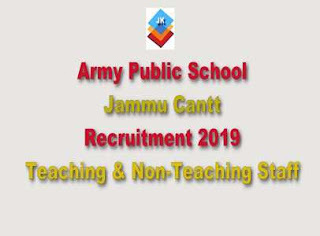 APS Jammu Cantt Recruitment 2019: Army Public School Jammu Cantt has invited applications from the eligible candidates on prescribed format to fill the posts of Teaching and Non-Teaching Staff. Candidates interested to apply for the Army Public School Jobs 2019, can download the application form which is available on the official website of APS Jammu Cantt. For more information regarding APS Application Form 2019 read the notification given below. Post Graduation in the subject with B.Fd with 50% marks in each. M.Tech/B.Tech/MCA/M.Sc/B.Sc in computer science with PG in computer Science from a recognized university. Graduate with Fine Art/Art/Drawing & Painting as one of the subjects with minimum four years diploma from a recognized institute/university. Graduate with 50% Marks in aggregate and B.Ed with Teaching Experience at primary level. Maximum age for fresh candidates 40 years and 57 years for experienced candidates. Candidates may send their Application forms along with photocopies of all important documents and bank draft of Rs. 100/- in favour of the Principal Army Public School Jammu Cantt by hand.